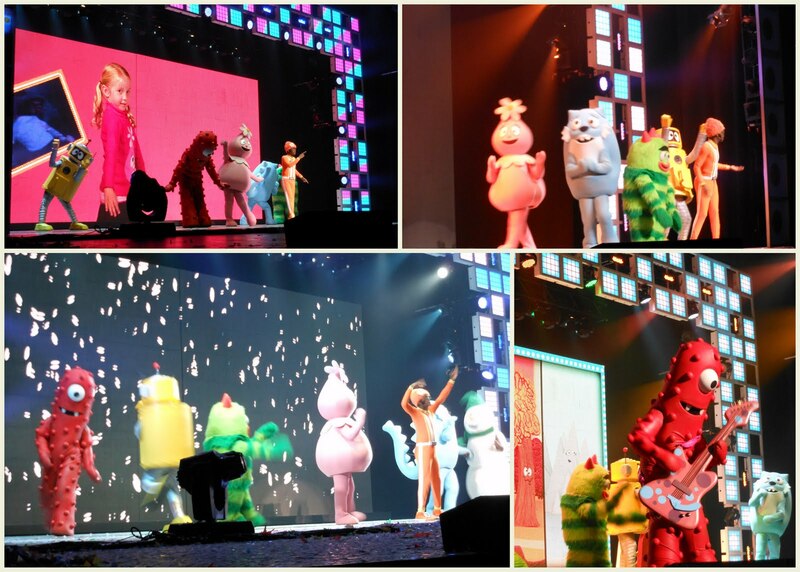 Noah has been waiting for this day since June, the Yo Gabba Gabba Live concert! Let me just start by saying Noah is a HUGE Yo Gabba Gabba fan since he was a toddler and he still adores it. It's actually a show I can tolerate (thank GOD he never got into Barney) so I was pretty excited about it as well. I bought the tickets way back in June. My sister actually had a code for tickets and guess what...it got us FRONT row seats! I have to admit, I was pretty psyched about our big day. As soon as we got through the door he immediately saw the merchandise stand. He picked out a t shirt to buy which I allowed because it's always fun to rock the shirt of who you are seeing (I remember rocking out with my KNOTB shirt, thanks dad). After we bought a Plex shirt we found our seats which were AWESOME! The show included all of the YGG favorites and Noah sang along to every song. During intermission we stopped and shopped again and bought a Muno doll. I think Noahs favorite part was when Biz Markie came out to do his "Beat Of The Day" and when confetti/leaves/snow would come from the "sky". He had a great time and it was a nice thing for Noah and I to do together with everything going on. Oh and on the way out Noah suckered me into a Brobee backpack, so yes that's right we walked out with a tshirt, a doll AND a backpack. Hopefully Noah is still into them if they come back to town because I really liked it!